U.S. Labor Department released monthly unemployment data for November 2008 and it’s not a pretty picture: the monthly unemployment rate reached a 15-year high of 6.7% in November. 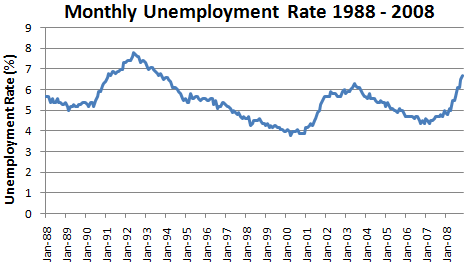 The last time when monthly unemployment rate was this high was September 1993. According to the report, U.S. employers eliminated 533,000 non-farm positions last month, followed by 403,000 in September and 320,000 in October. In just three months, as we have seen the deterioration of the economy, more than 1.2 million jobs have been lost, that’s more than 2/3 of the total job losses since the current recession started a year ago. 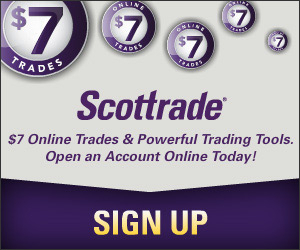 A total of 1.9 million people have lost their jobs since December 2007. As of November, the number of unemployed person in the country grew to 10.3 million. That is certainly one of the worst charts I have seen for a while. 6.7% huh? I remember riding in the elevator at work this past summer and seeing on the screen that the umemployment rate was 5%. Then it was 5.5%.Then I got laid off and the unemployment rate became 100%! It seems like there’s no place to hide during this economic downturn… With that in mind, however, we’ve gotta all stick it out together! Right?